Wouldn’t it be nice to call up a trophy buck? Our fast food society and “Millennial Hunters” have been conditioned to a quicker and easier life. Pizza, Chinese, Plumbers, and many other services are just a text or cell phone call away. It’s more sporting to hunt harder and without unfair advantages. If hunting was easy, it would not be sporting. Great hunters are still the ones that can interpret sign, know the wind, Scout, plan, and prepare for a wilderness encounter. Things will happen when they happen and not always when you want them to. So, how does the average hunter talk to the deer? There are dozens of call choices available for purchase. To use them successfully, you need to know what the call means and when to use them. Hunters need to be aware of the calls that they will hear during deer season. This means vocalizations that are related to breeding. Some of these calls talk to does and others, bucks. If the does come to your call, there is a good chance that a buck may follow, especially during the Rut. Fawn Bleats tend to promote the harvest of does. Calling deer is not just about vocalizations. You also need to mimic the sounds of Rattling, making rubs, and combat. Having multiple callers helps. This strategy also works well with elk. Breeding Deer Talk falls into two categories. Bucks are establishing their breeding territory. Grunts, wheezes, and snorts will relate to this purpose. Secondly you need to be aware of other sounds of the season. This may include antler rattling, tree rubbing, and other related sounds. Pre-Rut means that buck groups break up and hormone levels increase. This is antler rubbing time. Mimicking this sound can be effective. Bucks are strengthening heir necks, cleaning their antlers, and leaving scent. 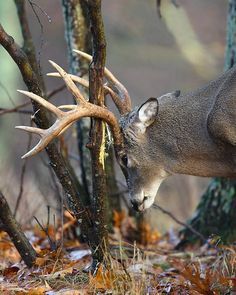 Antlers are a huge part of a buck’s dominance. Therefore, rattling can also be effective. Dominate bucks will readily investigate any insubordinate buck from trespassing. Rattle accordingly. Once Rut kicks in, buck combat is more common. Rattling should be more aggressive and mimic fighting. Scrapping leaves and breaking branches helps. Multiple hunters can increase the calling excitement. Older bucks seldom respond at this time. They tend to keep a younger mentored buck as a partner. The smaller buck will investigate while the dominant buck observes. Having a second phantom hunter away from the caller can be exciting. This hunter needs to locate quietly upwind from the caller. Expect the bucks to come from areas used for bedding or scrapes. Once you locate a buck’s staging area try calling using a grunt call. Find a tree to make a rub. Use a shed antler for the rubbing. Simulate the sounds involved in this process. The buck will first grunt, then rake the tree with the antlers. Kicking leaves and shaking the tree is also important. Grunt a few times during the event. This should take no longer than a minute and is not repeated for 15-20 minutes. Your grunt should mimic the energy, strain, and effort in making a rub. The best calling zones are in the bucks staging areas and not their sanctuary. Once you bust a buck out of their safety zone, they will leave the area. Explore your hunting areas and see the sign where the sounds were produced. If nothing happens, move to the next area. Bucks are not evenly distributed in the forest. Habitat will determine locations of deer. Remember that you are a guest in the bucks living room. They know where every stump, rock, puddle, and tree are. They spend all day, every day strolling their habitat. They know the smells, signs, and sounds that should be there. As a hunter, plan accordingly. The hunter also needs to be aware of their scent, camouflage, and movement. Knowing the wind is major. Hunt into the wind. Walking in leaves and sticks sounding like a deer is fine. Walk like you have 4 legs. Never stop in the open. Stand by cover or trees. The secret to calling is to work out a plan and to tell a story. Just calling randomly alerts deer that an intruder is in their living room. This hunting strategy requires patience, persistence and practice. Give calling a fair chance and be aggressive. Learn from your mistakes. Deer will hear you 3 times, see you twice, but smell you once. Keep this in mind when moving close and talking to the animals. For more Montana Grant, grunt him up at www.montagrantfishing.com.